Last month we launched ‘Make or Mend of the Month’, our brand new blog series which shares your projects with the aim of inspiring others. For our very first ‘Make’, we chose Anmarie Bowler’s ‘Tie Project’ - a simple, stylish idea that's easy to adapt depending on what you have in your wardrobe and sewing box. 'I long to make or mend. I often dream about the things I’d whip up or rework if only I could put pedal to the ground with confidence. In my next life I intend to return as a practical but visionary seamstress. In this life, I’ve plenty of ideas but have to employ help to realize them. Oh, to those who can sew! How I admire your skill, your daring, your notions. Please accept a non-sewing seam sister into your fold. I found this once-strapless bustier (below) at a charity shop in Richmond - a picturesque riverside spot in South West London with loads of charity shop choice. I don't do strapless for two good reasons...but I knew I could rework this pre-owned Banana Republic top to suit my figure. My husband occasionally buys vintage neckties in job lots so he's got a bag of rejects on the go. From the bag I retrieved two ties similar in colour and weight. (If you don’t have easy access to neckties, you’ll find them at any charity shop, cheap). While wearing the bustier AND a bra that clasped behind my neck, I pinned the neckties so they covered the undergarment. 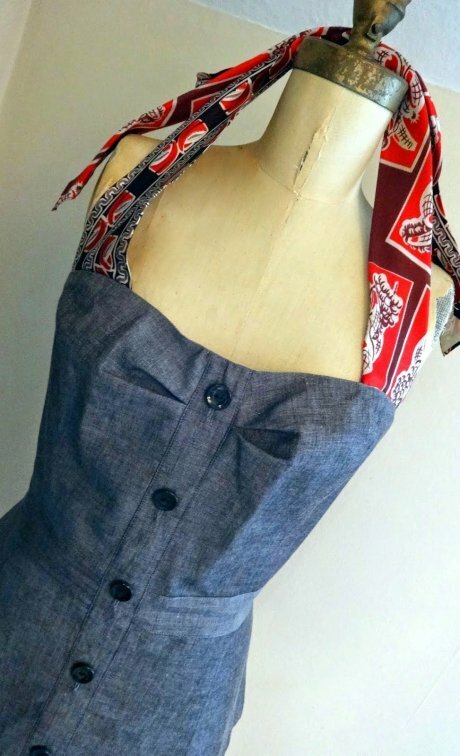 I then took my pinned top to my local tailor, who sewed the necktie 'straps' into place.